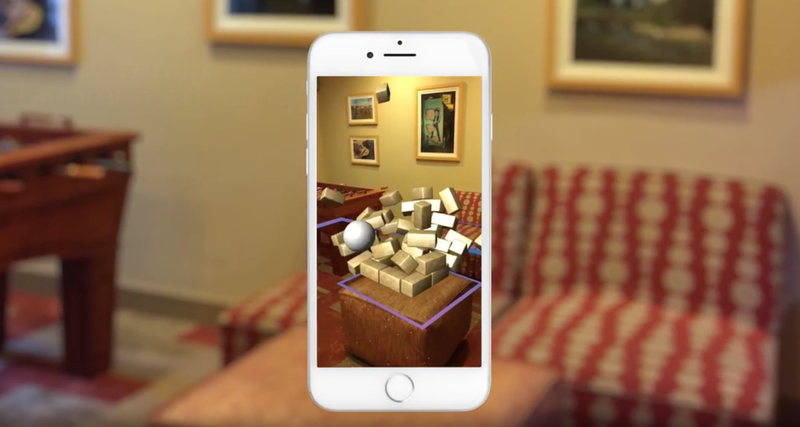 When AR Kit was just released, we really wanted to build a simple experience that would leverage physics in AR experiences. Not just plop a 3D character or object on the ground or on a table, but really explore interactions of the real world objects and virtual objects. To do that, we built "Boom," a simple block crash game with some really interesting mechanics. With an iOS phone, the user launches a cannonball with their thumb towards a pile of blocks in a space. Piles of blocks can fall on any surface in the room and the user can walk towards it, aim, and shoot. By utilizing the entire room as a possible play space instead of one surface, Boom blurs the line of the real and the virtual. Going a step further, we also wanted the virtual blocks' contact with the surfaces themselves to have a feeling of weight and gravity. Here, we play the game on a small surface and the blocks that aren't supported by the surface tremble, break, and fall as one would expect to see in the real world.